All Progressive Congress(APC) governors from the north-east say President Muhammadu Buhari deserves a second term based on his performance in office. The governors who attended the meeting in Bauchi include Kashim Shettima of Borno, Bindow Jibrila of Adamawa, Mohammed Abubakar of Bauchi, Isa Yuguda of Bauchi and Modu Sheriff of Borno, among others. 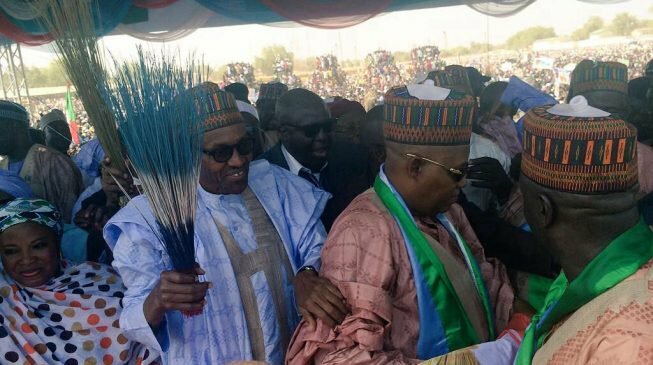 Governor Shettima of Borno said the president has done extremely well as the sub-region has benefitted from his administration. “We all know the sorry state of the country, we are the net beneficiaries of President Muhammadu Buhari’s administration in terms of appointment, securing lives and properties and projects,” he said. “Therefore north-east is Buhari’s territory, believe me the sub-region will solely back him in 2019 general elections,” he reiterated. Mustapha Salihu, APC national vice-chairman for north-east, said the president has done much for the sub-region in terms of providing infrastructural development as well as the fight against insurgency. He said: “I want to say that this gathering is mainly an endorsement meeting to show appreciation to Buhari’s administration for salvaging us from the shackles of insurgency, no single kilometre is now under Boko Haram. On his part, Ahmed Lawan, senate leader, said senators of APC are more united after the defections and will continue to support the present administration on efforts to provide development in the country. He said: “We are committed, loyal, patriotic and we will continue to support the president to actualise the wishes of Nigerians, and we will be committed party members who are supporting the continuity of the present administration. “The 2019 general elections will be determined by integrity, history of candidates we know how they destroyed the resources. People should remember where we are coming from and where we are, right now.